Bring 'em home, our motto at Greek House Chefs has such significant meaning and is the driving force behind everything that our Blue Coat Army does in our Chapters nationwide. A little over a year and a half ago, we took a long look at what our intentions were with the company and after many long heartfelt conversations, we landed on "Bring 'em Home" as our company motto. It was hard to sum up our intentions in just 3 small words, but they are powerful and get our purpose across perfectly in so many facets of our business. It's an all-inclusive term for both the members in our fraternities and sororities as well as our elite chef team. For our students, it means bringing them home to the dinner table each night. Being a member of a fraternity and sorority is such a big thing. We know how it goes, parents and students alike invest a lot of money to be involved in their organization and we want to make sure they are living that experience to the absolute fullest. We have college age daughters ourselves, so we're right there with you! How do we, a food service company, have an impact on students gathering together and creating lifelong bonds? Simply, we bring 'em home. We welcome them with open arms and delicious greens, providing the best food on campus and accommodating a variety of dietary restrictions to make sure that students always want to come home to dinner. Making sure they are always attending dinner with their friends gives them the opportunity to slow down a little in their hectic schedule. Enjoy a fresh, home cooked meal in the company of their fellow chapter members instead of grabbing a cold burrito from the dining hall. Not only does it give some comfort to students who are missing Mom's home cooking, but it opens their eyes to new flavors when their professionally trained chef makes something for dinner that might be something new for them. We know how hard it is for students to find comfort in campus dining, which is why we try to be that comfort for them right in their own home away from home. Not only do we comfort them with food, but the chef in their kitchen becomes part of their family. We hire only the best chefs and try to perfectly match their personality to each chapter. We hear all the time from our students, 'I was sick this week and Chef Alex knew that I had a big test coming up so he made me his secret family recipe to make me feel better.' 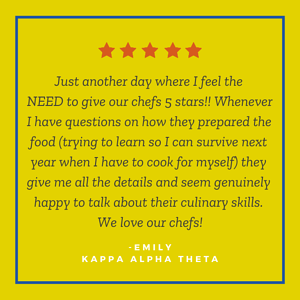 The bond between a chapter and their chef is something special, and boy do we know it! To see how we bring 'em home up close and personal, check out our video here. 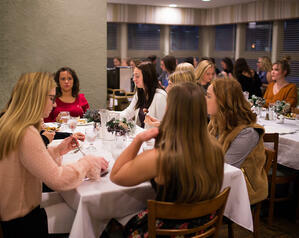 Interested in how we can bring your chapter home for dinner? Let's chat. Previous Post Who is... Steven Troge? Next Post Who is... Frank Hines?